The Malaysia Property Exposition (Mapex) 2012, to be held from March 2 to 4 at Halls 1, 2 and 3 of the Mid Valley Exhibition Centre in Mid Valley, will be opening its doors to top property developments from abroad. 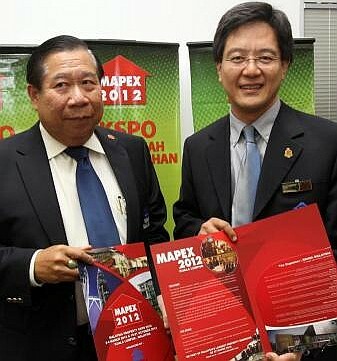 Info: Ng (left) and KL Rehda chairman NK Tong showing the promotional material for Mapex 2012. The event, themed “Home and Abroad”, is jointly organised by Rehda Malaysia with Rehda Kuala Lumpur and Selangor. It will feature international property players with properties from overseas. As of now, companies with projects in Thailand and the Philippines have registered their participation and Mapex is now awaiting confirmation from Australian participants as well. Mapex 2012 committee chairman Datuk Ng Sieng Liong said the event would attract foreign investors to invest in Malaysia and with it promote tourism at the same time. “Malaysians are the biggest investors in Singapore and nowadays, with just 10 to 12 hours of travelling, you can be in any part of the world. “We also want foreign investors to come to Malaysia and invest,” said Ng, adding that more than 50,000 people were targeted to visit the exhibition. Over 65 developers from the local and international arena have registered for Mapex, showcasing over 300 housing developments including Sime Darby Properties, SP Setia Bhd, Mah Sing Properties, Lebar Daun Development and Seri Pajam Development. The developers will be showcasing various developments in Selangor, Kuala Lumpur, Johor, Malacca, Negri Sembilan, Pahang and Perak. Major banks and financial institutions will also be offering attractive and competitive finance packages for buyers at Mapex including Bank Simpanan Nasional and Bank Mualamat. There will also be talks on topics of interest to house buyers such as safety and financing during the three-day exhibition. The exhibition is open from 10am to 9pm daily. Admission is free.